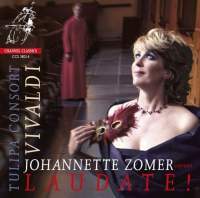 This marks the debut recording of the Tulipa Consort, founded by the experienced Dutch soprano Johanette Zomer, whose discography has often been distinguished by her stylistic integrity and intelligent communication of poetry. Ascende laeta was probably designed as an ‘introduzione’ to the large-scale Dixit Dominus (RV595) written for the Ospedale della Pietà in about 1715. The amiable string-playing and Zomer’s easy gracefulness scamper along together lightly in the motet’s conclusion ‘Sternite, Angeli’, which refers to the ascended Virgin being praised by the flowers of the meadows and shepherds; perhaps the bagpipe drone bass notes could have had a shade more rustic presence but the violins in thirds imitating pastoral recorders are played with charming fantasy. This segues seamlessly into arias from Juditha triumphans (1716); the title-heroine’s contemplation ‘Transit aetas’ is accompanied with gentle sensuality by delicate pizzicato strings and mandolin, and a pair of soft recorders combine rapturously with Zomer’s subtly sensual phrasing for the Assyrian captain Vagaus’s gorgeous evocation of evening breezes (‘Umbrae carae’). Sustained yet intimate lyricism also captivates in the slow aria ‘Rosa quae moritur’ at the heart of the motet O qui coeli terraeque serenitas (probably written in Rome in about 1723-24). After a glut of such thoughtful beauties, the earliest of Vivaldi’s three settings of Laudate pueri (RV600, c1715) grants an opportunity for animated vigour and extrovert theatricality – although the more reflective moments make the most profound impressions, such as the dialogue between Zomer and violinist Lidewij van der Voort in the doxology. It is poor that Channel Classics neither includes the sung texts nor lists the aria titles in the track-listing (the mere citing of tempo markings is unhelpful). Thank goodness for Hyperion’s generous provision online of Michael Talbot’s materials for The King’s Consort’s Vivaldi sacred music series.